I forgot this was the season finale! I was totally awesome ambushed by the music. There will now be a pause while I play the opening credits 11 times or more. Best. Soundtrack. Ever. And can we talk about how we’ve never really gone into this? Even this episode talks not about Kelly dying but literally how she won’t be a mother to her unborn child. Did she have no life before this? Does she not envisage any life after this? She worked on the President’s staff – don’t tell me she wasn’t a woman with a career and ambition and life! To have her get pregnant and that be the sum total of her existence is grossly reductive. To have her thoughts of dying be only about how she won’t be able to raise her demon baby – however emotional – completely removes her as a person. Kelly is a walking incubator which, along with the dubiousness of Mary last episode and fitting her more firmly into the Mother Role is deeply problematic. These women have lives and existences outside of reproduction and its down a terrible job of representing that. But when they try to contact Rowena who caged Lucifer last time- they get Lucifer. He claims to have brutally murdered Rowena and we have a body apparently proving it. RIP Rowena? Damn, I will miss her… and not – I liked her as a character. She was fun, powerful, shameless and unapologetically focused on her own will however evil. But she also ruined every storyline with Crowley – because of his terrible character development. On the whole, Rowena will be missed. Crowley does drop in though with a revelation and a deal: he doesn’t want to be king of hell. As I’ve observed for several seasons now he seems to have little or no interest in actually running hell. On top of that he is constantly being challenged and his life threatened. He’s done – and he’s willing to lock down the gates of hell so all demons (Except him) are trapped if he can join in defeating Lucifer. Now there’s a switch – does that make Crowley solidly Team Winchester? Giving birth to a Nephilim has also created other side effects – including a portal to an alternate dimension. In this world everything is awful and Castiel visits to check this out – nearly being killed by a demon and being saved by – ALTERNATE WORLD BOBBY! Yes Bobby lives! This alternate world – as Castiel explains to Sam and Dean when they catch up (and of course they arrive. Yes they have issues with Castiel but ultimately, allowing Lucifer find the baby is a BAD IDEA) – is a parallel Earth. One in which the Winchesters were never born (so Alternate Bobby doesn’t know them) so they weren’t in a position to save the world. If nothing else, this world is proof the Winchesters have done more good than harm despite almost ending the world a dozen times or more. Because they’ve stopped it ending a dozen and ONE times. This Earth is a warzone between angels and demons and they’re all happy to murder humans caught in the cross fire. It’s not a happy fun place. Castiel is sure demon baby –Jake – will fix it. Sam and Dean don’t have his faith. ….Castiel is dead as well?! What what what what? That leaves one more side character – Mary – fresh from Kelly’s death/birth bed. She attacks Lucifer with the Men of Letter’s anti-angel knuckle dusters and manages to drive him through the portal. Which closes after them. After both of them. Mary is now stuck in the alternate dimension. With Lucifer. Lucifer is now pleased. And now I say no. No, killing Rowena, Castiel, Crowley and Mary? All of them? Seriously this is nearly the entire supporting cast of Supernatural. There’s no way. 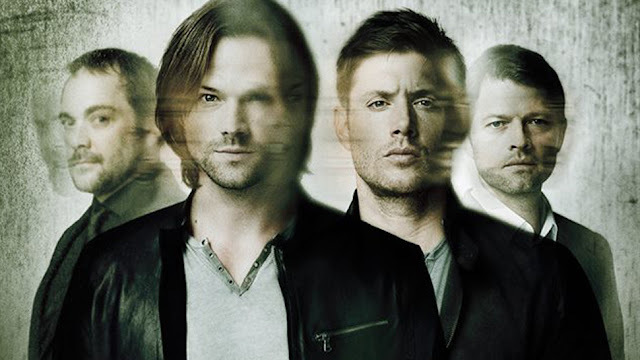 Absolutely no way Supernatural is having this big of a reboot. No way. I don’t buy it. One. Two. Maybe. But all four? And Castiel? Naaaah, the writers aren’t that daft. Especially when Sam goes to see Kelly’s body and finds the naked, apparently nearly adult Nephilim Jake. Whose betting resurrection is one of his talents? And then we have the Men of Letter’s storyline which managed to consume the plot but only limp forward due to many plot conveniences – not least of which is the sheer dubious way the Men of Letters operates; their terrible defence, their constant killing of each other, the lack of battle training. Everything about them made sense if you saw how the plot had to work –but there’s just absolutely no way these guys managed to keep the UK supernatural free.